Increasing quality patient referrals is a top goal of any home health care provider. But coming up with new ways to stay ahead in your marketplace can be challenging. That’s why we’ve selected 12 of our most effective strategies and compiled them in one easy-to-follow e-book. Discover straightforward solutions to strategically improve your home health referrals today. 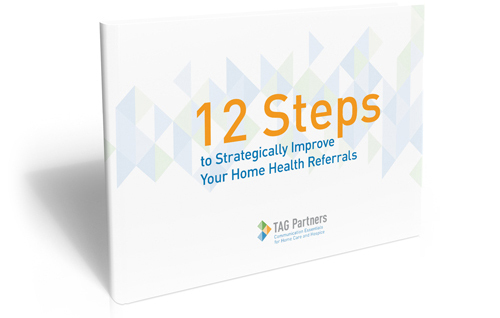 Thank you for downloading 12 Steps to Strategically Improve Your Home Health Referrals! To learn more about TAG Partners’ broad variety of marketing and operational materials to help your home health, hospice or private duty home care agency succeed, visit www.partnerwithtag.com or call us at 866.232.6477. Want even more? Check out our other free titles available for download.